The Shut Up and Sit Down effect. 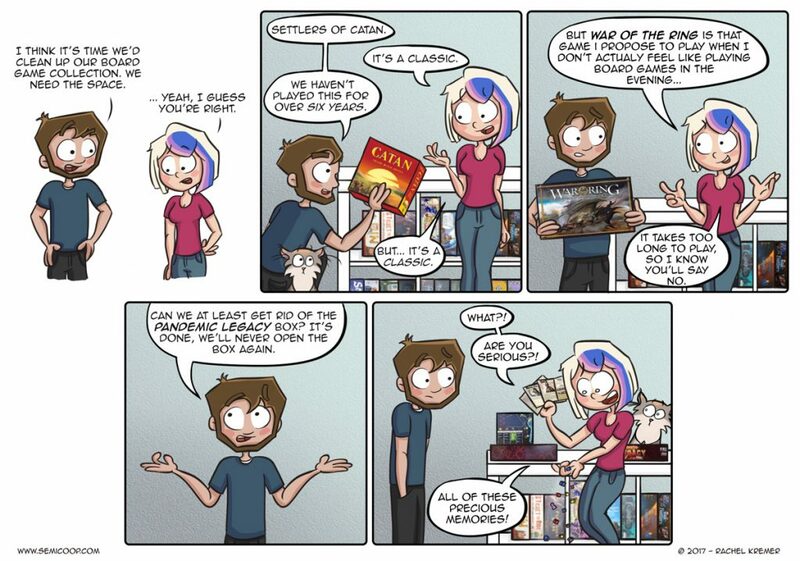 Most of us board gamers know it. It has two sides. They manage to make you very enthousiastic and make you want to buy a game, BUT you’re not the only person, so chances are that the game will be sold out within days. This also happened to Conditierre. The game is still unavailable, alas. But speaking about Captain Sonar, that game looks amazingly cool! Like mentioned in the comic we are already familiar with playing Artemis, a Star Trek bridge simulator, so this just feels like a logical next step. 😉 In Artemis we always place the other bridge team in a different room, so I can’t wait to see what happens when your enemy is actually on the other side of the table. Screaming at each other or trying to communicate in whispers in a room while the other team is talking right through it. The stress of the radio communicater when the submarine surfaces and can’t write down the movement of the other team. YES. We need to play this! Oh yeah: a thank you to all the websites that covered Gen Con so fantastically for all us Gen Can’t-people. It was hard work for you guys, but it is much appreciated! What game you wanted to buy was sold out because of the SUSD effect? Wil Wheaton’s TableTop had a similar effect in the industry, so much so that he coordinates with publishers to prepare print runs ahead of the seasons now. This happened with Arctic Scavengers and Sherlock Holmes: Consulting Detective. For Arctic Scavengers I scoured the internet until I found a site in Canada that miraculously had copies in stock, and I bought three of them and paid international shipping, then gave two copies to my friends. Sherlock Holmes I had to wait two years until they finally re-printed it. How do you like Arctic Scavengers? It looks very interesting, but the player interaction seems pretty mean and brutal. I’m not Patrick but I do like Arctiv Scavangers. The player interaction is not that bad as it can be in early Dominion boxes for example, witch and Militia is a much worse card than the corresponding cards in Arctic Scavangers and it is not that rewarding to go super aggresive so I do not find the player interaction to be any problem. A that’s good to hear and with the Recon expansion there seem to be a ton of options to play a version of the game that works best for the group. Welp, back it goes on the wishlist :). I have not played it with the Recon expansion, it seems like it can solve my issues with the game! I did not know it even existed, thanks for mentioning it! You know, regarding Condottiere, I was surprised to see copies being sold on AliExpress (though it was the Chinese version, which was is no big deal given only the rules book is affected).